What does Kite & String mean? Where did your brand name come from? 'Kite' means light, playful, balanced, and fun. 'String' means grounded to a place, our small farm. Kite & String ciders are produced at Finger Lakes Cider House on our organic and diversified farm in Interlaken, NY. Why did you change your name? What happened to Good Life Cider? We always loved how the name "Good Life Cider" was grounded to Good Life Farm, but as we began to garner media attention and distribute our ciders widely, we encountered a company with a similar name, so we rebranded in 2017 to avoid confusion in the national marketplace. 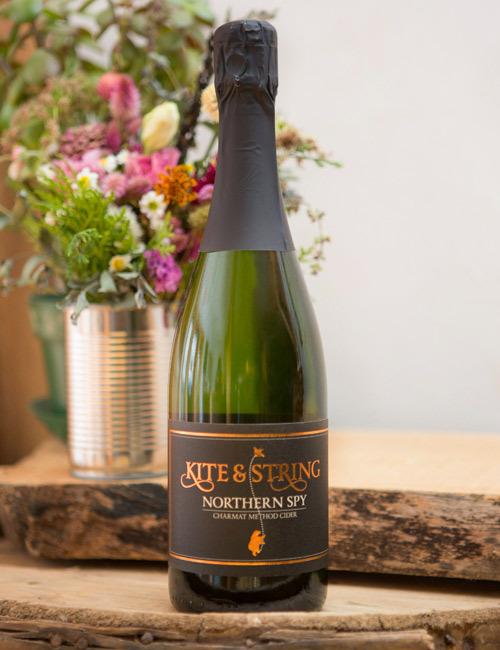 We're the same people in the same place producing our best orchard ciders as Kite & String. Melissa Madden and Garret Miller started Good Life Farm in 2008. In 2013, we added cidermaking with Garrett’s brother Jimmy Miller. In 2015, we opened the Finger Lakes Cider House tasting room with our ever-growing crew of farmers, artists, bartenders, and alchemists. It is an honor to share these gifts with you through food and drink. Logo and labels for Kite & String and Finger Lakes Cider House by Q. Cassetti.